Any motorist who drives through the Chicago Metropolitan area during rush hour understands it can be a trying ordeal, and very dangerous. In fact, Chicago and the surrounding suburbs have some of the busiest, most treacherous driving conditions in the nation. As a result, many individuals suffer injuries in car accidents that are often life changing and permanent. If you were injured in a Chicago car accident caused by a reckless driver our attorneys can help. Rosenfeld Injury Lawyers LLC has helped motorists, passengers, and pedestrians recover financial compensation for their injuries related to collisions with reckless drivers. Contact us now for a free legal consultation. Internal Injuries – Car crashes often cause injury to internal organs when the accident forces the body into another object, including the steering wheel. Other times, internal injuries are the result of being hit by flying debris from outside or inside the car. Internal bleeding must be treated immediately to minimize the risk of death. Lacerations – Flying objects, sheet metal, and broken glass can easily penetrate the car in an accident causing cuts or lacerations. Minor cuts typically require only a few stitches or can heal with bandages. However, deep lacerations often require surgery for repair due to blood loss. Victims of a car accident typically deal with scarring caused by cuts and might require additional surgery to minimize the visibility of scars, especially those on the neck and face. Traumatic Brain Injury (TBI) and Concussion – A serious blow to the crash victim’s head can cause brain swelling that if severe, could result in permanent injury. Anytime a victim is hit in the head during a car accident, it is essential to tell paramedics responding to the crash. Often, swelling begins at the accident scene, even though the injured party feels no effects or does not exhibit symptoms until time has passed. It is essential to have immediate treatment during the “lucid interval” to minimize any potential problem, including death, caused by head injury. 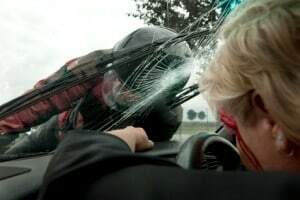 Neck and Back Injury – Many victims of car accidents experience whiplash, where the motion of the head and neck move outside its normal range. Often, the movement strains tendons, muscles, and ligaments. Even though it is considered a soft tissue injury, whiplash is a serious problem. Spinal Cord Injury – A spinal cord injury typically results in a loss of movement or sensation, and usually involves severe pain. Injury to the spinal column can create permanent or temporary paralysis involving the lower body (paraplegia) or all extremities including the shoulders and arms (quadriplegia). Broken Bones – Car accident victims usually experience broken ribs, legs, arms, ankles, and wrists. Even a minor break that requires a cast can involve physical therapy when the bone has healed to restore complete range of motion. In some incidences, severe bone breaks require extensive surgeries to heal correctly, followed up by intensive physical therapy. Some accident victims have compound fractures, where the bone pierces through the skin, requiring extensive repair and ongoing therapy. The National Highway Transportation Safety Administration (NHTSA) has determined that where the passenger or driver is seated inside the vehicle when the accident occurs correlates to the severity of the victim’s injury. As expected, when seated closer to the accident point of impact, the victim is likely to suffer more severe injury. Any serious injury caused by a car accident will likely involve extensive medical bills and ongoing rehabilitation expenses. The financial setback is often compounded by lost wages from missed work during the time it takes to fully recover. In addition, crash victims often experience emotional problems including depression, especially if their quality of life is changed irrevocably by long-lasting, serious injury. If you are suffering serious injuries from a Chicago car accident, Rosenfeld Injury Lawyers LLC can help you obtain financial compensation. The team of specialized personal injury attorneys can pursue compensation on your behalf to obtain enough funds for medical treatments, procedures and surgeries along with recovery funds for lost wages, property damage, and your intensive pain and suffering. Call the law firm at (888) 424-5757 or fill out our online contact form for a free initial consultation.